28 January, and cost a whopping $200m. outgoing chairperson Jean Ping from Gabon. The election ended in a stalemate. 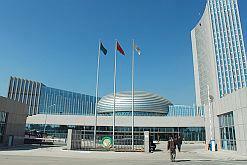 The new headquarters of the African Union (AU) were unveiled at the 18th African Union summit, which took place in Addis Ababa, Ethiopia, from 23 to 30 January 2012. Chinese president Hu Jintao announced at the Beijing Summit on China-Africa co-operation in 2006 that it would donate the US$200-million (R1.5-billion) needed to build the headquarters. China described this initiative as “the largest single Chinese aid project to Africa since the construction of the Tan-Zam Railway”. Built between 1970 and 1975, this railway enabled land-locked Zambia to access the Tanzanian port of Dar es Salaam. He added that the building is “a reflection of the new Africa, and the future we want for Africa”. Nguema was succeeded by Beninese president Boni Yayi as AU chairperson during the summit. Jia Qinglin, China’s senior political adviser and member of the Politburo Standing Committee of the Chinese Communist Party, said: “This towering complex speaks volumes about our friendship to the African people, and testifies to our strong resolve to support African development. Alluding to the fact that China is the largest trade partner to the African continent, Qinglin said the building symbolises “deepening relations between China and Africa”. Chinese investment in Africa is now valued at $150-billion (R1-trillion). The glitzy new AU building stands where Ethiopia’s oldest maximum security prison, known as “Alem Bekagne” (prison for life). once stood. Ethiopian prime minister Meles Zenawi said: “In this very place, prisoners who had no hope have lived. They were people who were imprisoned for life. The 27-storey building has become Addis Ababa’s tallest building and alongside it is a circular conference hall. Construction by China State Construction Engineering Corporation started in February 2009 and was completed in December 2011. Nearly 1 200 Chinese and Ethiopian workers were involved in the work. “China’s amazing re-emergence and its commitments for a win-win partnership with Africa is one of the reasons for the beginning of the African renaissance,” said Zenawi. The summit, which saw heads of state in Africa converging on Addis Ababa, aimed to improve intra-African trade. At the end of the summit, the AU said that it planned to create a continental free trade area by 2017 and estimated that the cost of developing Africa’s infrastructure would be about $60-billion (R467-billion) over the next decade. During the summit, leaders voted in their new chairperson for 2012. The winner Yayi said: “We shall continue to work hand in hand to ensure that we consolidate all what we have achieved so far. Delegates were also asked to vote for a new chairperson for the AU Commission. 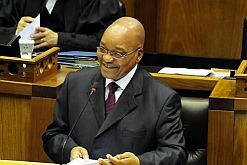 The race was between Jean Ping of Gabon, who was seeking a second term as chairperson, and Nkosazana Dlamini-Zuma, South Africa’s home affairs minister. The voting was abandoned when neither candidate could get the support of two thirds of the 53 AU member states entitled to vote. Leaders will gather in Malawi in six months to vote again for the position.